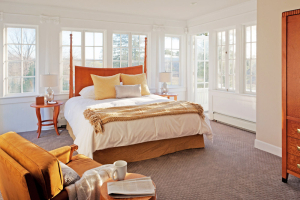 Room 201 is located on the second floor of the Mansion overlooking the English Gardens and a glorious sunrise. 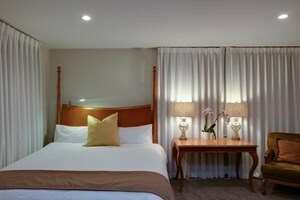 This spacious room is furnished with 2 Queen-sized beds, a desk, large flat-screen TV, and an in-room refrigerator. The private on-suite bath features a whirlpool tub with rain shower. 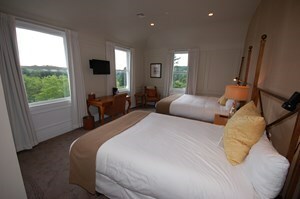 Room 203 is located on the second floor of the Mansion. This spacious room is furnished with 2 Queen-sized beds, an armoire, desk, large flat-screen TV and an in -room refrigerator. The on-suite bath includes a whirlpool tub with rain shower. Room 204 is located on the second floor of the Mansion. 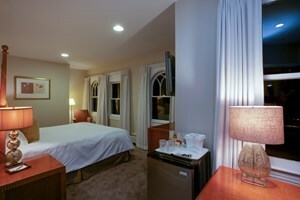 This spacious room with an inside hall entry features a bedroom to the right, furnished with a King-sized bed, desk, armoire, large flat-panel TV and in-room refrigerator, and an on-suite bath to the left featuring an oval soaking tub with rain shower. Room 309 is located on the third floor of the Mansion and features a wall of unique windows. 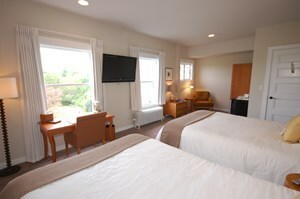 This room includes a King-sized bed, writing desk, large flat-panel TV and in-room refrigerator. The on-suite bath has an oval soaking tub with rain shower. Room 311 is located on the third floor of the Mansion. 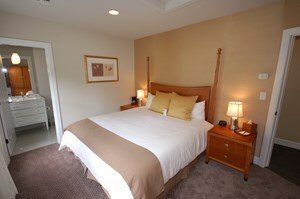 This room is barrier-free and furnished with a King-sized bed, desk, large flat-panel TV and in-room refrigerator. The on-suite bath for this room has a large, easy-entry shower with built-in seat. 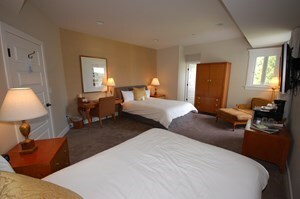 Room 314 is located on the third floor of the Mansion with views of the English gardens. 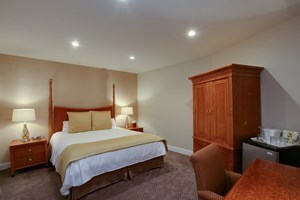 This room is furnished with a King bed and a Queen bed, desk, flat-panel TV and in-room refrigerator. The on-suite bath includes a soaking tub with rain shower.